Impressions of a Reader...: Holiday Reads! Well is everyone ready for the holidays? I hope you all have the best of holidays with your families. I'm preparing myself for a few days of rest and relaxation, and am hoping for a quiet celebration with friends and family. December has not been a great reading month for me, so hopefully this next week will yield a few hours where I can sneak away and read a few Christmas or holiday-themed books. I'm in the mood for those this year. I'm planning to read, or re-read some old favorites and/or books that I've had in my TBR for a while. 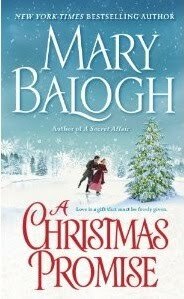 A Christmas Promise by Mary Balogh will definitely be a re-read! I read it back in November when it was first re-released and recommended it as an excellent read. This is a Christmas historical romance full of family joy, warmth and traditions. I think this magical story should really be enjoyed during this week and plan to do so. You can read a full review of this book here. Next on my list is a book that I first read about two years ago in 2008. A Virgin River Christmas by Robyn Carr is a short story that truly embodies everything you'll find in that series: strong females, dedicated male characters with a service or military background and healing storylines. This was the first story I read by Robyn Carr and the one that "hooked" me into reading her Virgin River contemporary romance series. You can find an excellent review by JillD who reviewed this novella recently at Romance Rookie. 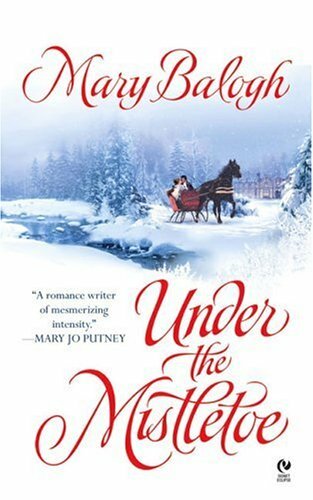 Under the Mistletoe by Mary Balogh is a collection of short Christmas novellas and one of those older Signet releases by this author that I've been wanting to read for a while. I'm sure that some of stories will be better than others, but since this is Balogh and I love her 'true to period' writing style, I'm really looking forward to reading them. The short format to the single stories are perfect for this week. I can read one or two and continue if there are interruptions. Perfect! For this book I found an excellent review by The Romance Reader for you. Or you can always check out different opinions at Goodreads. The Heart of Christmas with Mary Balogh, Nicola Cornick and Courtney Milan is a book I featured last year as one I wanted to read. Well, this was one of those books that I never got to, and I'm definitely reading this year! These three wonderful writers are not to be missed, and I hope to enjoy every single story. There are many reviews for this book and most of them seem to be on the positive side. Here is one by AnimeJune from Gossamer Obsessions. For those of you who love the LGBT M/M romance sub-genre, I cannot recommend enough the His for the Holidays anthology featuring Mistletoe at Midnight by LB Gregg, Nine Lights Over Edingburgh by Harper Fox, I Heard Him Exclaim by Z.A. Maxfield and Icecapade by Josh Lanyon. There's something for everyone in there. I don't know if I'll have the time to re-read this whole anthology, but I'll sure try to at least re-read one or two of my favorite stories. Complete review here. My plans seem overly ambitious and I just noticed Baloghs are prominently featured! But hey... I do love her writing and her Christmas stories. What are you planning to read over the Christmas holidays? Romance? Paranormal? Sci-Fi? Urban Fantasy? Or like me, are you hitting the those holiday-themed stories? Lots of Mary Balogh ones! I hope you like them, I got a bit of a love/hate relationship with her books. I'm taking this week off for re-reads of favorite titles, actually. It has been a slow month for reading too. His for the Holidays is definitely on my list! Everyone loves it, and all the stories sound so good! Also I'll be reading the Naughty and Nice antho as well. Love Dane, Stacey, Burton & Hart! Aside from that, it will be whatever strikes my fancy. AnimeGirl, I noticed, Baloghs garlore, lol! Enjoy your re-reads! I just finished reading the young adult novel, Dash & Lily's Book of Dares and simply adored it! Now I'm reading The Gift by Nora Roberts. It has two novellas in it. I finished the first story and really liked it. Very sweet. I'll read the second story today and tomorrow. I read the Balogh, Cornick, Milan anthology last Christmas and really liked all three stories! Merry Christmas to you and your lovely family. xo Hope to see you soon. I'm glad you enjoyed A Heart of Christmas too! Looking forward to it. :) I hope you have a wonderful Christmas with your beautiful family! XO and see you soon! Out of interest, what did you think of A Virgin River Christmas? I think that's the book that started me off on my growing dislike for the series. I just really didn't want to read about the heroine's toiletry habits!